Do you have between 60 and 100 lbs to lose? Here are 16 ladies and gents who were in the same boat a you. Some of these ladies were “done” with their hCG weight loss journey when I interviewed them, and some were still on their journey partway through. Some used hCG injections (you can purchase those here), some used drops. You will find that initially, your weight loss average – how much you lose during 1 round, may be pretty high. Some of you ladies MAY even have that notorious 1lb/day weight loss that circulates online a lot – the 40lbs in 40 days type deal. Many of you still may not, but it’s definitely possible. But this number WILL go down as you get smaller. And there is nothing wrong with you or you body when this happens. It’s a simple matter of science really – when you are a smaller person, you actually have a lower metabolism in general naturally just by way of weighing less. This means you burn less calories at rest than before. Additionally, think of this: if you lost 35 lbs in one round whiled weighing 250lbs to start, that’s 16% of your bodyweight you lost. But if you lose another 35 lbs in a round, with a starting weight of say 170 lbs this time, that would actually be 20% of your total bodyweight you lost – logically it doesn’t make sense to lose a larger percentage of bodyweight as you get smaller. Does this make sense? That same 35 lbs is a larger amount technically coming off a smaller body than a larger body. If you lost the same 16% of your bodyweight, that would be 27 lbs this time – and like I said you likely won’t even continue to lose the same percentage of bodyweight but less – if you lost say, 13% of your bodyweight at 170 lbs ,that would be 22 lbs. My point is, it’s totally normal for your total weight loss each round to gradually go down, this is GOING to happen and I’m warning you now so that you won’t think you’re doing something wrong and get all bummed out. You are doing JUST fine girl. Cindi lost 63 lbs with hCG drops. From 202 lbs to 138.8lbs and size 14-16 to a size 4. Her weight loss journey with hCG (after trying lots of different weight loss programs like Weight Watchers, Advocare, Slimfast, Atkins, Southbeach Diet) has been successful despite having various health conditions in the past like gallbladder surgery, frequent migraines, and an endometriosis surgery. After losing around 100 lbs on hCG and gaining them back some few years ago, Andrea decided to take a few more rounds this year and lost weight again. Recently, she decided to follow the Simplified p3tolife program and has been in love with it ever since! On top of having a variety of tasty food in proper amounts, she was able to lose 9 more pounds on the p3tolife program. Bella lost 65 lbs, from 216 lbs to 149 lbs. She used different kinds of hCG on her 5 rounds. Prior to the hCG Diet, she had bodyfat testing with 40.9% bodyfat. After her hCG journey, she only has 27% fat – a loss of 44lbs of actual fat. She was very thin until third grade and then started gaining weight. She didn’t lose weight until her junior year in high school via Weight Watchers. She started at 196 lbs and ended at 138 lbs but wasn’t healthily eating while on that diet. Her family also has a history of blood sugar issues and obesity. Melissa lost 85 lbs with 2 rounds of hCG injections, going from a size 24 to size 8. She had diabetes and high blood pressure prior her hCG journey and she actually recovered from them after the hCG Diet! All her life, she always believed that she was overweight and did a lot of yo-yo dieting. She actually had her stomach stapled in 1997 after having gained a considerable amount of weight after her children were born. She did very well with weight loss and maintained for 3 years until she had a hysterectomy in 2000 and within a month, her weight gain began all over again. On this interview, she shared some great tips and tricks for staying sane on P2. Sarah lost 90 lbs with four 28-day rounds of hCG injections. Her heaviest was at 210 lbs with her height of 5’1″. She went from a size 16 to a size 2. She has Tourette syndrome and Polycystic Ovary Disorder. She struggled with her weight since she was a little girl with medications which made her gain 30lbs in a year’s time and it continued to balloon as she grows older. Now she shares with us how she overcame her eating disorder. Nance lost 75 lbs with hCG injection in the late 50’s. She went from size 22 to size 8 and lost 12 inches off her waist! She talked about moving past the yo-yo dieting mentality which started as early as the end of high school. We have a very detailed discussion about Phase 3 that will definitely benefit you guys. She charted her macros and calories on Phase 3 so if you want to know more, check out this interview! Casey lost 80 lbs with hCG injections. She went from size 18 to size 6. She also EXERCISED while on P2. She discusses in her interview how she modified her eating on Phase 2 to compensate for that. She also has a very interesting tip on cooking food easier and healthier. She gained weight during her pregnancies. She was hit by a car when she was pregnant with her first son. With steroids, she gained a significant amount of weight in a very short time. She also went through the worst postpartum depression, where she described it as “feeding her feelings”. James lost 65 lbs in 1 round of 8 weeks with hCG injection. He’s 53 and was at his heaviest at 485lbs before. For any of you who think it’s impossible for a large grown man to be comfortable on a 500 calorie diet, perhaps James’ input will help you re-think that. The hCG hormone does not appear to be a placebo in light of user feedback like James, who at 6’3″, with a very active job, can take 200 IU of hCG a day and live on a 500 calorie daily diet for 8 full weeks, without hunger comfortably. Stefanie lost 70 lbs with 3 rounds of hCG injections. She was an operating nurse, teaches nursing, and has even worked in the bariatric field of nursing. She saw and was very aware of the complications that can occur with bariatric surgery like gastric bypass. When the tables turned and she was pondering bypass surgery herself, her friend who was a nurse practitioner responsible for follow up care of bariatric patients suggested she compare the pros and cons of surgery vs. the hCG protocol. Over 60 lbs gone with hCG injections. She lost about 25 lbs in each of 2 rounds of hCG of about 6 weeks each. She lost several additional pounds during Phase 3. She had an injury a couple of years ago and broke a bunch of bones in her left foot. She wasn’t able to exercise to keep her weight in check and it just went up and up, gradually. Then she got married and it went way more up. Mary was actually considering doing a gastric bypass before doing hCG. Linita lost 74 lbs with hCG. She also found the hCG to improve her fibromyalgia symptoms. She had hysterectomy years ago and she’s on hormone replacement. There have been a few times however that she has had to “catch” weight gain before it got too out of hand and do correction rounds. Usually, she would find herself about 10 lbs higher after the holiday months and do a correction round in the early part of each year. Her weight has pretty much been between 142-152 most of the past years until she ended up having a surgery- a tummy tuck. As many women know, excess skin can be an issue after major weight loss. One point of note is that she found the hCG to improve her fibromyalgia symptoms. Carma lost 80 lbs with hCG. She started her hCG journey at just over 50 years old and she is in menopause.S he was heavy her entire life, even as a child. Her highest weight was 247 lbs. She stared her journey at just over 50 years of age at 235 lbs in a tight size 18/20. She’s 5’7. She’s now a very comfortable size 12 and says she can even occasionally wear a size 10 in certain brands. She has gone to great lengths to discover the best recipes, the best resources, the best tools to prepare food in a newer healthier way that doesn’t feel like a downgrade to the taste buds. And she shares all that in this interview. Elke lost 70lbs on hCG and lost another 13 lbs or so on her own. For her, it was the classic head to college story. Top ramen, eating out with friends too often, super burritos at 4 in the morning. She says she “ate until it hurt.” Even though she would feel full, she’d keep eating. A combination of emotional eating and not paying attention made her overweight. She did something different on her Phase 2, she used the Jay Robb protein shakes for 1 of her meals while on P2. She also did Clean Loading which worked positively for her. 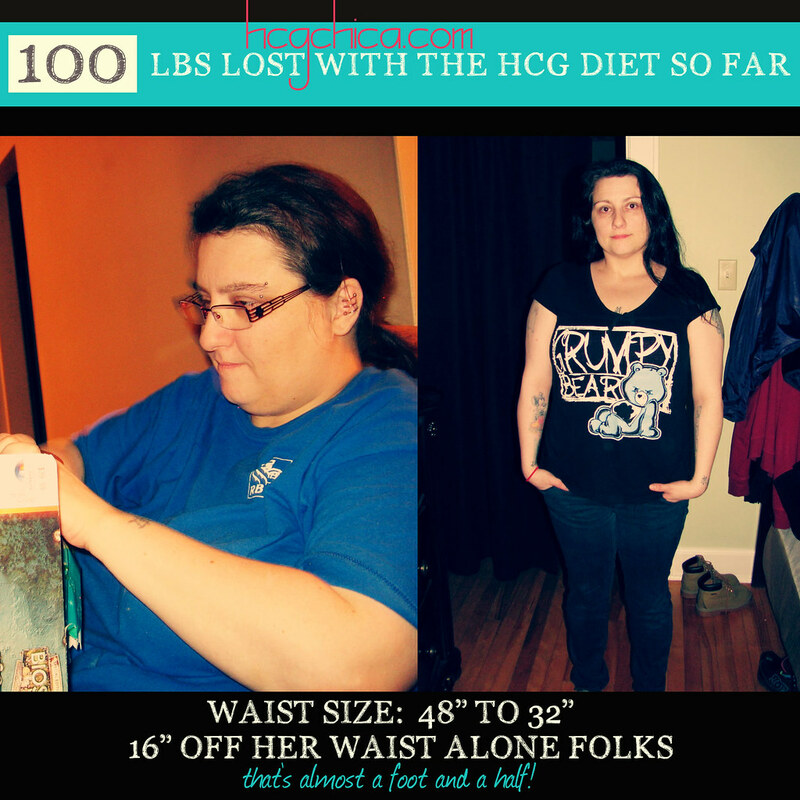 Ginn lost 100 lbs with hCG. She began her journey at 281 lbs, lost 80 lbs, and 100 lbs overall so far- the last 20 lbs that have come off have been all through a combo of clean eating and exercise. Ginn says she was heavy even as a child as young as six and being teased horrendously. She recalls trying to do her first diet when she was 10 or 11. She did fail some rounds so we talked about the keys to her long-term success and what helped her live in a healthy way. B lost 100 lbs in 16 months. From size 28 to size 8 in just 4 rounds of the hCG Diet. B took a solid 6 months to research the protocol before starting it herself. B took a whole 8-month break between her 2nd and 3rd round. She maintained her weight extremely well during this time, and even managed to only gain 3lbs while on a month-long trip to the UK eating hot dogs and croissants! She shares that throughout her 4 rounds, she has had to change her dose every round. We discussed lots of tips on Phase 2 and how she maintained her weight loss. Laurie lost almost 80 lbs with homeopathic hCG pellets. She went from a tight size 15/16 to a comfy size 3 in jeans. She lost the majority of her weight in only 3 rounds of this protocol- she got down to 127 lbs from 204 lbs. Like many of us, she has done a couple fine-tuning rounds since then. Laurie found that as she got to the point where she had very little weight left to lose, she needed to increase her calories above and beyond the 500 calories. There’s a lot to learn from Laurie and she also has her own very informative YouTube channel where she vlog her hCG journey. Jeana lost 65 lbs with prescription (RX) hCG injections. She said that she started feeling uncomfortable being overweight and she was concerned how her daughter will feel having an overweight mom so she started doing the hCG. She lost 65 lbs in 5.5 months, 2-month break included. She lost about 27 lbs in her first round, then she actually lost 11 more lbs in P3. Her 2nd round which she is still on (at the time of the interview), Jeana started at 182 lbs and as of this writing she’s actually 149 point something lbs, so a loss of over 32 lbs so far in about 50 days or so. 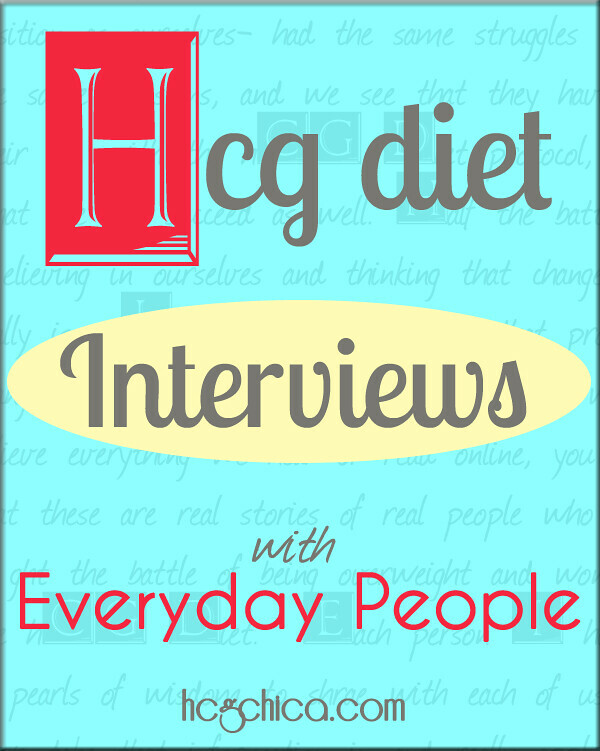 We discussed stalls on the hCG diet and how the online hCG community helped in her success.